One year ago, I published I wear the ring and publicly announced the availability of this digital memorial to the Citadel Men interred and memorialized here in 16 military cemeteries across Europe and North Africa. It has been a year of vibrant impressions and one of the most spiritually and emotionally enriching years of my life. As I have tried to get to know these men and to share their stories, I have had the pleasure of making many new friends, and reconnecting with old friends, here in Europe and in America. So many warm and incredible people have touched my life this year. For this, I am truly grateful. A few days after “going public”, I received an email from an alumnus. A few weeks later, I flew over the North Sea to visit Cambridge American Cemetery in England with him, two of his sons, and the historian of “The Bloody 100th”. It was an inspirational and moving experience that I shall never forget. Together, we paid our respects to the three Citadel Men resting in peace and the one memorialized on the Wall of the Missing. Together, we recited The Cadet Prayer. On that day, I began a new phase in this journey. See my post The Major of St. Lo. During Memorial Day weekend, I visited the Citadel Men resting in peace at the Netherlands and Henri-Chapelle American Cemeteries. The two cemeteries are located just 20 kilometers from each other, one on either side of the Dutch-Belgian border to the east of Maastricht and Liege in the direction of Aachen, Germany. An alumnus wrote to me several times during April and May, “Don’t forget those who are still Missing-In-Action!”. In remembrance of the eight men who rest in no known grave here in Europe and North Africa, I laid flowers at the grave of an unknown a few meters from Albert S. Hagood, Class of 1931. They are not forgotten. Two posts – Part I and Part II – describe the events of that spectacular Memorial Day weekend. Since last April, I have received details about our men from many places – alumni, family, their “adopters”, historians, and archivists. Four men have received the attention of several posts. Their names, faces, and stories have become familiar. Thomas Dry Howie, Class of 1929, (top left) the “Major of St. Lo”, buried at Normandy American Cemetery. Charles Marion Thirlkeld, Class of 1944, (top right) a young anti-tank platoon leader attached to Easy Company, 506th Parachute Infantry Regiment, 101st Airborne Division at the defense of Bastogne, buried at Luxembourg American Cemetery. 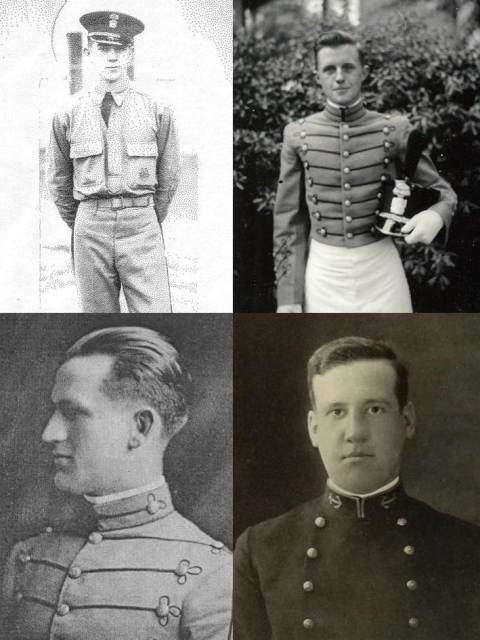 John Hodges David, Jr., Class of 1914, (bottom left) the 1st Citadel graduate and 1st South Carolina officer killed in action after the Americans joined WWI, buried at St. Mihiel American Cemetery. William Montague Nicholls, Class of 1912, (bottom right) who joined the British Royal Field Artillery and was the 1st Citadel Man killed in action in WWI 1915, no known grave, remembered at the Loos Memorial. Don’t miss the next post. “Follow This Blog”. Sign-up on the right hand sidebar. “Like” The Citadel Memorial Europe on Facebook where photos and short facts are being posted and shared daily. The photo below was taken at Normandy American Cemetery. I visited there in August with a group of Dutch college history students and teachers. We each planted a “Big Red” at the grave of the six Citadel Men interred there and by the name of another on the Wall of the Missing. A laminated photo of the man with his name and class year was attached to the flag. On the back of the card was The Cadet Prayer. As we moved from one grave to the next, immediately visitors would gather around the flag we had left. I have written two posts about that pilgrimage… Visit to Normandy – Prelude and Normandy – Agenda. In September, members of the BENELUX Citadel Club met three Dutchmen who have adopted the graves of Citadel Men at the Netherlands American Cemetery. The below photo was taken at Plot D. Four of the eight Citadel Men interred at the cemetery are buried in Plot D. Three of their headstones can be seen in this photo. The grave of the fourth, Edwin Karl “Benny” Newman, Class of 1939, is just behind the photographer. In the posts Citadel Men and Margraten Boys and Memorial Day Part II I begin to explain how the people near to the cemetery have adopted the fallen Americans and keep their memories alive. In November, I paid my respects to the two Citadel Men who rest in peace only a few meters from each other at the Ardennes American Cemetery not far from Liege, Belgium. Like the Citadel Men in Plot D above, only a few meters separate their final resting places. On New Year’s Eve, the history teacher who guided our visit to Normandy, visited Florence American Cemetery in Italy, and he provided photos of the headstone of Joseph Dexter Brown, Class of 1940, and the names of Samuel Rigby Sprott, Jr., Class of 1944, and Francis Vernon Lael, Class of 1940 which I have now included on their individual In Memoriam pages. 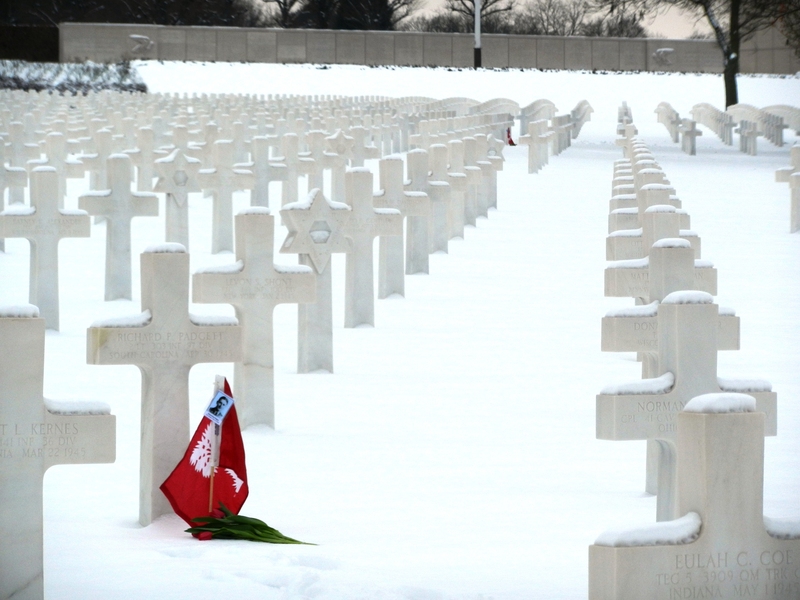 During a very snowy, long weekend in February, my wife and I visited St. Mihiel American Cemetery at Thiaucourt, France. The ABMC staff was very pleased when I provided to them a dossier on John Hodges David, Jr., Class of 1914. With pictures and articles in hand, they spoke enthusiastically of now being able to include him in their cemetery tour. A few days later, we visited Lorraine American Cemetery at St. Avold, France. We had been there two years before to pay our respects to Peter Franklin Cureton, Jr., Class of 1940. We did not know then of a Second Citadel Man at Lorraine, Richard Paul Padgett, Class of 1944. The photo below was taken from the grave of Paul looking towards the grave of Peter. Rounding out my top 10 memories of the past year is my wife on the steps of the Montsec American Monument in France. Snow fell heavy the night before. It was a good 25cm deep on the road up to the top of the hill. The absence of tracks indicated that no one else had been up there. We took the risk and were handsomely rewarded. See the photos and read about the monument. My wife does not always understand why I am doing this, but she supports me unconditionally. In my heart, she is bigger and more solid than the monument behind her. or share your thoughts or a “birthday” wish for The Citadel Memorial Europe. Please use the “Leave a Reply” box at the bottom of this post. I did not begin to name all the people who have touched my life and contributed to this project this year because, if I did, I would never get this posted. There are just so many wonderful stories to tell and support to acknowledge. What this means, in very positive terms, is that I have a tremendous amount of content from which to draw for future, and more frequent, posts. This entry was posted on April 19, 2013 by Roger Long. It was filed under Ardennes, Florence, Henri-Chapelle, Loos, Lorraine, Luxembourg, Memorial Day, Netherlands, Normandy, St. Mihiel, Uncategorized and was tagged with 101 Airborne Division, 29th Infantry Division, 506 PIR, ABMC, Ardennes American Cemetery, Cambridge American Cemetery, Citadel Men, Colleville-Sur-Mer, Florence American Cemetery, Henri-Chapelle American Cemetery, Loos Memorial, Lorraine American Cemetery, Luxembourg, Major of St Lo, Margraten, Memorial Day, Montsec American Monument, Netherlands American Cemetery, Normandy American Cemetery, Royal Field Artillery, St. Mihiel American Cemetery, The Big Red One, The Citadel, The Netherlands, WWI, WWII. This is great. Thankful for our brothers that gave their life for our country. Beautiful, Roger–and so touching. Now you’ve made me cry again. Roger, ook ik wil je bedanken voor al het werk dat je verzet heb. Ik ben een van die mensen die jouw heeft leren kennen en ik ben daar blij om. Via jouw ben ik in contact gekomen met familie van “mijn” soldaat. Ik hoop dan ook dat we elkaar in de toekomst zeker weer zullen ontmoeten. Dus zoals gezegd: Thanks!!!! Roger——-Having researched and posted much of long forgotten Citadel history for others to learn about and reflect, I know full well just how rewarding this experience for you has been. Specifically, to bring back to life the stories and memories of individuals who have passed, is especially personally rewarding. Nice work! Such a wonderful project, Roger. It is especially heart-warming that John Hodges David, Jr., and his story, will be in the thoughts of so many in the years to come because of your research. Well done! Excellent project Roger, For many, this is bringing these heros back to be remembered and memorialized by a new generation. In one year you’ ve already achieved a lot! In short time we will make your work official, by creating the Citadel Europe Memorial Foundation. I’ll be honoured to take part in the work you started: To ‘give’ the Citadel men who fell in Europe their stories and faces ‘back’.